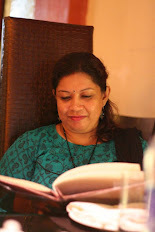 in International Cuisine, Italian cuisine, Noodles/pasta, One Pot Meal ideas, Soup, Veg. Tomato Soup is a healthy drink generally served as an appetizer before the main meal but during winter it can be lifesaver. The hot piping soup on a biting cold night gives your soul a relief and satisfaction. The temperature was quite down this winter in my part of World this time, so one such chill night my daughter demanded a hearty soup for dinner. Another bad thing about winter is it makes you lazy and you don't want to spend much time in kitchen. This happened to me most of the days. I just want to cuddle up in warm blanket all the time. But I can't serve just anything to my family. So, thought to making an one-pot full meal adding some pasta in a tomato soup for a filling as well as a satisfying meal. I kept it very simple and healthy. Just seasoned the tomatoes with garlic and some Italian herbs. Added some vegetable stock and pasta in the pot. Simmered the pot and cooked till pastas are just cooked, but not overcooked. Added some winter veggies, too. You can add some grated mozzarella but it's your choice. And a hearty meal is ready in about half an hour. Olive oil/White oil : 1 tblsp. Mixed Italian herbs : 1 heaped tblsp. Take a heavy bottom pan, heat olive oil. Add sliced/chopped garlic and fry for 1-2 minutes. Now, add chopped onions and fry until they turn soft. Add chopped tomatoes, Italian mixed herbs and mix. Cook on high flame for 2 minutes. Cover and cook until the tomatoes are cooked well. Remove from heat and let it cool. When cool, using a hand blender or a mixer, blend the tomato mixture till it is well blended. Return this paste into the same pot and add vegetable stock and bring it to a boil. Add tomato ketchup and mix. Season with salt and black pepper as per your taste. Once the soup comes to boil, add pasta of your choice and cook till pasta is just cooked. If needed, add some more stock until pastas are cooked. As I like my pasta little spicy, I added little pinch of chilli flakes in the soup. But this is totally optional. 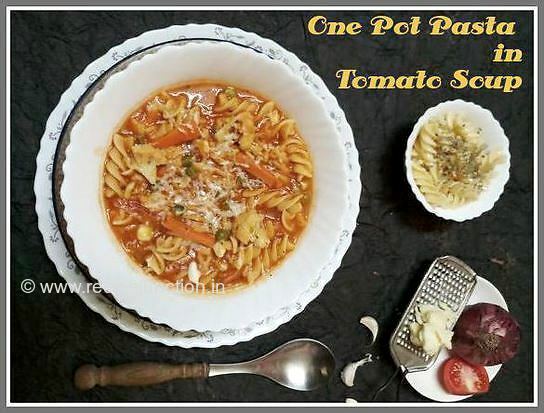 Tomato pasta soup is ready to be served. 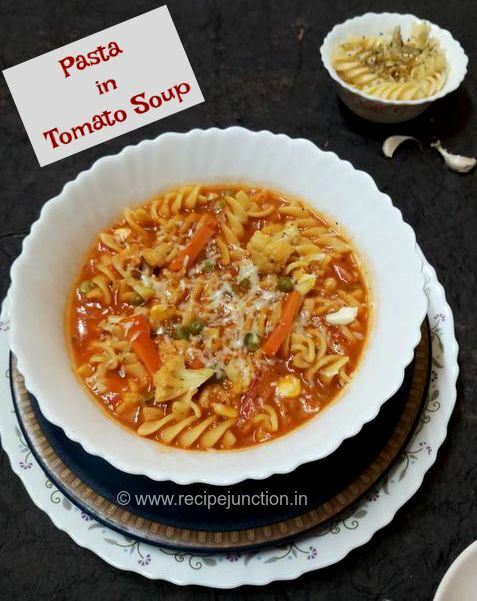 Serve in soup bowl and garnish with some grated Parmesan or mozzarella cheese when soup is still piping hot, so that cheese melts on your pasta soup and gives you a heart warming and delicious taste. Doesn't it such a soul-warming delicious bowl? 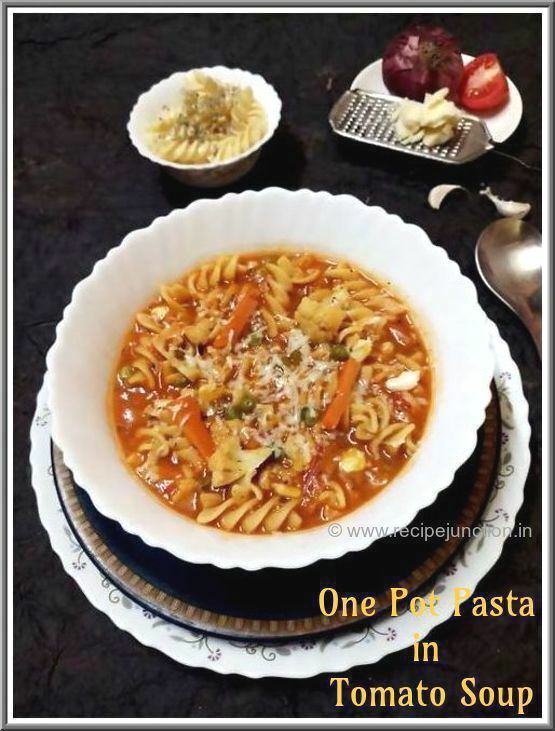 Try this before the winter is over...let me know how have you liked this idea and meal..waiting to listen from you all..
Labels: International Cuisine, Italian cuisine, Noodles/pasta, One Pot Meal ideas, Soup, Veg.